This newsletter is dedicated to the Male Tiger Sariska. "At one time he was the smallest male tiger dominated by all the other male tigers at Tiger Canyons. Running and fighting for his life, he failed to capture a territory and therefore was unable to mate with any tigresses. 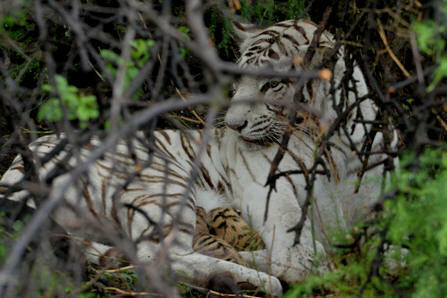 Now he has expanded his territory and fathered cubs with both Ussuri and Tibo (the white tigress). 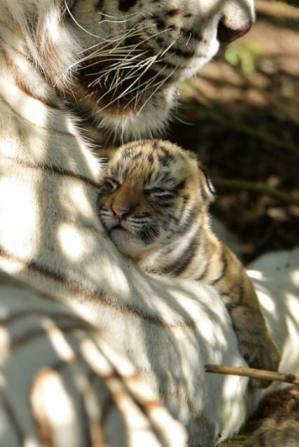 Sariska is the smallest male at Tiger Canyons. His father was Ron and his mother is Shadow. He was born into a litter of 4, of which 3 survived. His brother is the famous aggressive male Corbett and his sister is a shy female called Panna. In his early years, because of his size and temperament, he was unable to capture a territory at Tiger Canyons. All the large males dominated him and he survived by literally running for his life. On one occasion I filmed him as he backed down an antbear hole “warthog style” and fended off an attack from the big male Seatao. At that time I thought to myself that he would never be a dominant or breeding male at Tiger Canyons. However, twenty months ago, he was able to capture a territory in the South of Tiger Canyons. 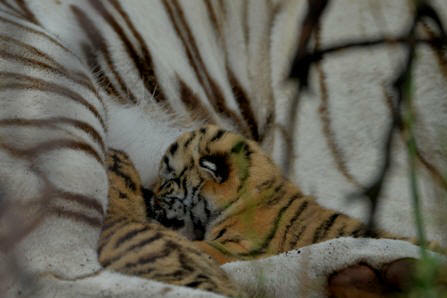 Fifteen months ago he impregnated Tigress Ussuri and 104 days later, 3 cubs were born. I was doubtful that Sariska could protect the area from male tigers that were not the father of the cubs and would kill Ussuri’s cubs. Then an interesting thing happened. 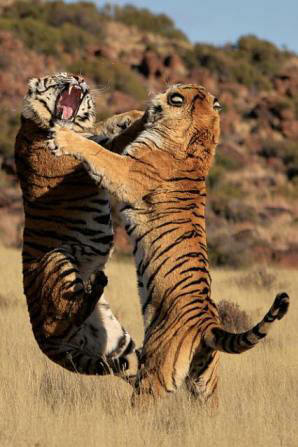 On the birth of the Ussuri’s cubs, Sariska became more aggressive. Male tigers that previously had dominated him, were now attacked when they came near his territory. Sariska bulked up and put on weight, giving him the edge when fighting other male tigers. Then incredibly he expanded his territory south towards the river, forcing the resident male Tiger Boy to move East. Now Sariska’s territory overlapped a portion, but not the whole, of the white tigress Tiger Bomb (Tibo’s) territory. Previously Tibo had mated with Tiger Boy (vasectomised) and Sundaban (Cryptorchidism - The testicles are inside the body of the male tiger, causing the temperature of the sperm to be too high and therefore not viable). Indeed during one estrus, I had filmed Tibo mate with Tiger Boy, Shy Boy and Sundaban, all unfertile males. Sariska is a normal coloured tiger i.e he possesses two normal genes. Tibo is a white tigress possessing two white genes. 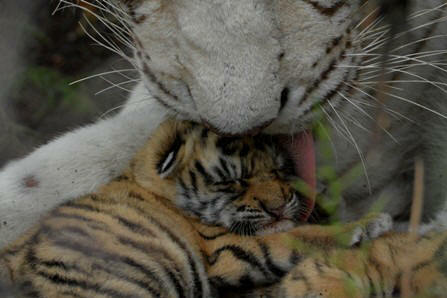 Therefore every cub will possess one white gene and one normal gene, making them a carrier of the recessive white gene. Before Tibo’s litter can be deemed a success, Tibo must overcome a series of problems. The first problem is that it is her first litter and she is inexperienced. The second and more serious problem, is that the den site that she has chosen sits in Tiger Boy's territory and not Sariska’s. If she mated with Tiger Boy and Sariska when the cubs were conceived, then it's possible that Tiger Boy will perceive the cubs to be his and therefore give them protection. If she did not mate with Tiger Boy when she mated with Sariska, then there is a good chance that Tiger Boy will kill the cubs because they are not his offspring. 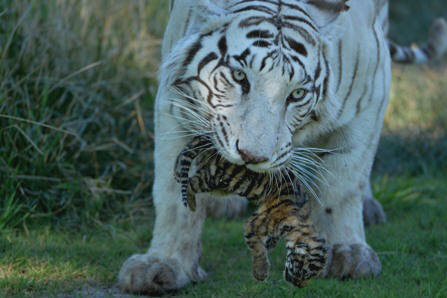 For now Tibo, the only wild white tigress in the world, has produced 4 normal coloured cubs of which 3 have survived. I will keep you informed every step of the way.